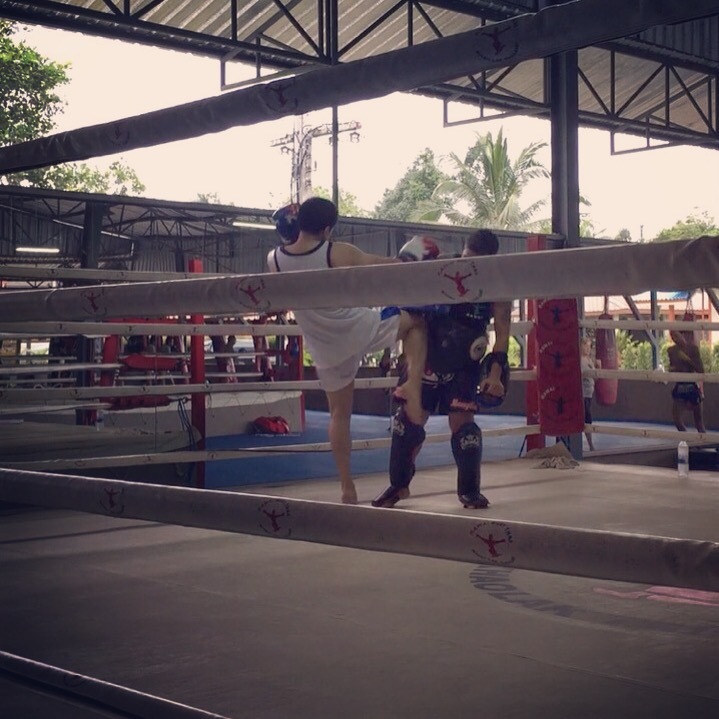 I got to do a Rawai Muay Thai round two (October 2015) as planned. Same as before, I camped with my wife and daughter in tow. The whole experience has now become a family affair for us. I did mostly privates and a couple of classes. My private sessions were juggled between krus Lemsing and Padu, a selection process based on prior group class engagements. Had I stayed longer, I would have added to the mix a couple more krus. Substancewise, privates are difficult to beat; however, a group setting brings in a different energy level (from camaraderie), combined technique and conditioning work, and discipline (brought about by Rawai’s well-thought-out structure). Get the best of everything by doing both! Nothing new for my daughter. 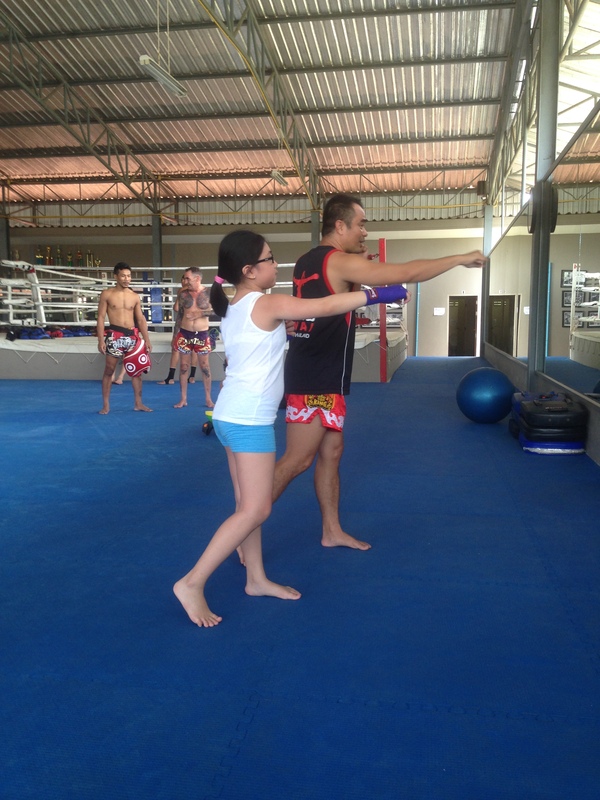 Her daily grind involved slugging it out with her favorite trainer, kru Lun. My daughter is quite happy with the way the art of Muay Thai is being passed on to her. It will be hard to fill Lun’s shoes now that we are back home. 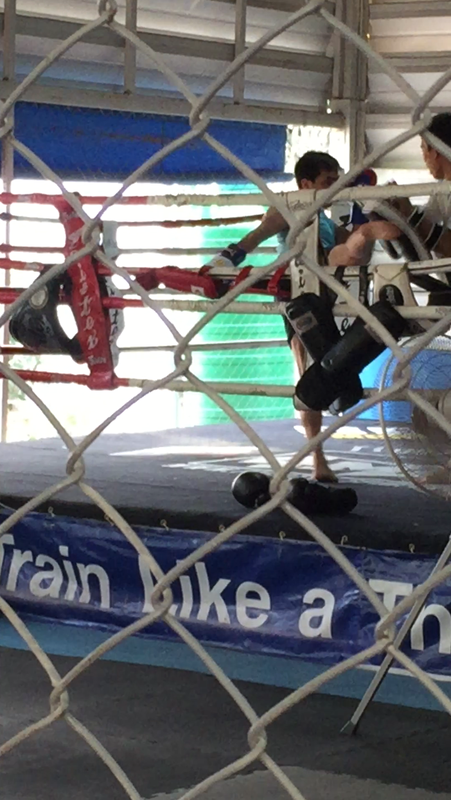 As usual, only good things to say about Rawai Muay Thai, Khao Lak. Next camp will definitely be a longer one! 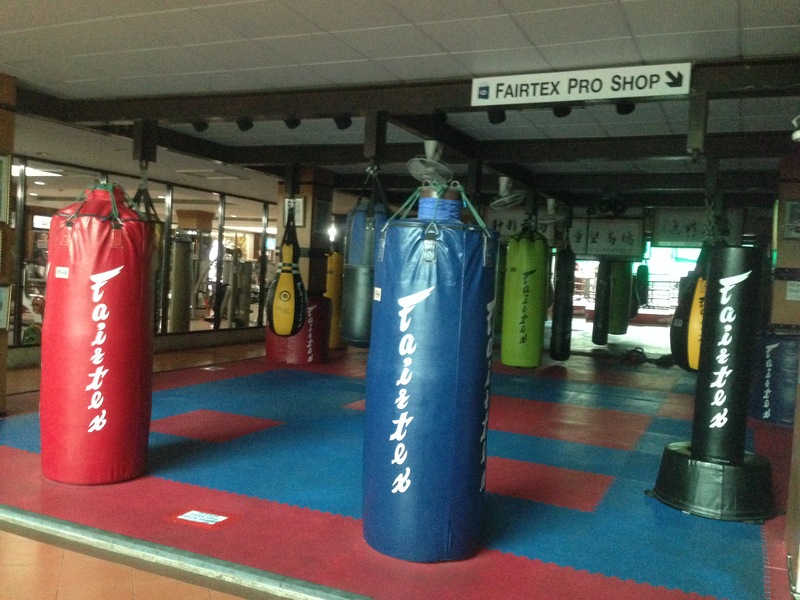 Home to one of Muay Thai’s best, Yodsanklai, Fairtex Pattaya is in a league of its own. This is taking into consideration the whole Fairtex Sports Club & Hotel experience. If you think Fairtex only retails gloves and wraps, well, they actually sell Muay Thai! Imagine a child soaked at Disneyland getting Mickey Mouse’s autograph, then you will have an idea. I ended up in Pattaya to attend the first-ever Fairtex Muay Thai course (July 2015). It was time and money well spent as Jamal of Aspata, course provider, did an excellent job putting us through our paces. The Fairtex team of krus, with the help of Prem (of Fairtex, providing translation services among others), allowed the participants to scratch the surface and take away invaluable information. I am glad to have signed up. With regard to Yodsanklai, we witnessed him train and had our photos taken. It was awe-inspiring to see him in the raw doing what he does best: drilling the basics and drilling them some more. Yod’s fundamentals are solid. You know what to expect, but the question is, “Can you hack it?” More often that not, his opponents cannot. I will definitely be back! Next time, it will be for a camp. Located in the south of Thailand and about an hour or so from Phuket International Airport, Rawai Muay Thai is as authentic as you can get. It is outside the touristy part of Phuket; hence, not much distractions. Live in the camp and you will be immersed: train twice a day alongside campers and Thais, fuel up in between sessions, doze off midday to recharge, and lounge around whenever. Same story the next day, for six days. Sundays are usually rest days, unless you want to train solo or do some privates (for an additional fee, of course). I did no privates during my July 2015 camp. My daughter worked with kru Lun, and it was all good! In hindsight, I should have joined her. What is noteworthy about Rawai is the friendly atmosphere, more like family, actually. Good winning culture instilled by camp owners, Tuk and Diana. Solid team of passionate and knowledgeable trainers led by Fin. Last but not least, excellent customer service from the people behind the scenes. Ko pun krap! The photo on the right was taken during one of the group classes. Special mention to kru Tong for his forbearance. The knee strike looks decent, but believe me, I am far from being worthy to be called a nak muay. I can only wish. Unfortunately, I did not get the chance to glam up and individually pose with the other trainers who gave me a beating: krus Nabun, Padu, Dam, and Lemsing. Kru Lemsing, by the way, is a living (and still fighting) legend of 499 fights! Chok dee! See you in a couple of days, Rawai Muay Thai! More pad Thai, Ring Five Cafe! 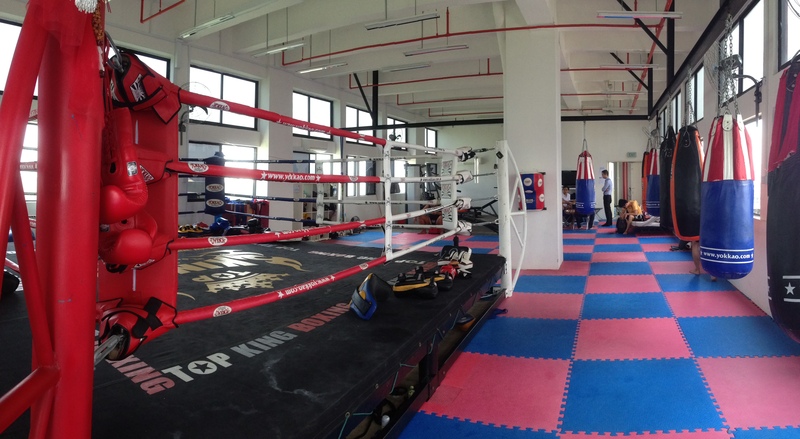 Unfortunately, as of June 2015, Singlanthong Muay Thai has ceased operations. Good thing, I was able to catch the tail end (March 2015) of this Singapore-based authentic Muay Thai gym. How can I forget krus San and Nga who were both from the well-known Sitmonchai Gym of Kanchanaburi, Thailand? Kru San, probably in his early 20s, was an amazing pad holder. Do not mistake his youth for inexperience; he knew his stuff quite well. His attention to detail was impressive. Kru Nga, on the other hand, was more or less in his 50s and with over 200 fights under his belt, provided the balance of maturity and mastery of the art. The gym had no egos except for modest ones. Like there was this French kickboxer who admitted that it took him over a year to learn how to throw a proper Muay Thai kick, despite having had experience fighting as a kickboxer back in the day. Hearing him address this gave me a bit of relief as I have yet to master the teh. Do I have to head off to Sitmonchai next? A February 2015 trip to Bangkok got the ball rolling, and now things are a little out of hand for me. Well, in a positive way. From BKK International Airport, my family and I went straight to the Marriott Vacation Club at the Empire Place to dump our bags. The plan was just to checkout Fighting Spirit Gym (FSG) that afternoon in preparation for next day’s training; nonetheless, I packed my gear and kicked off our 15-minute walk to FSG. I reckon if I felt good maybe I could start a day ahead of schedule, but it was not the best idea as the stress of travel took its toll. I still vividly remember the hardest three rounds of pad work of my life. ‘Was totally wasted after the third 4-minute round and had to say adieu to rounds four and five. FSG is a good quality gym in the heart of Sathorn. Walk in anytime during class hours and you will be assigned a Thai trainer, much like doing a private session. After 5 minutes of skipping, your trainer will rock and roll with you (depending on your skill level) from start to finish. As a newbie, I was ran through the basics from shadow boxing to focus pads to heavy bag work. Almost forgot, you would not be able to slack off even during the conditioning phase of the workout as the trainer will be by your side. Overall, a very good experience! The photo on the right was day one: practising some roundhouse kicks with an energetic kru (Art) while trying not to get too frustrated. 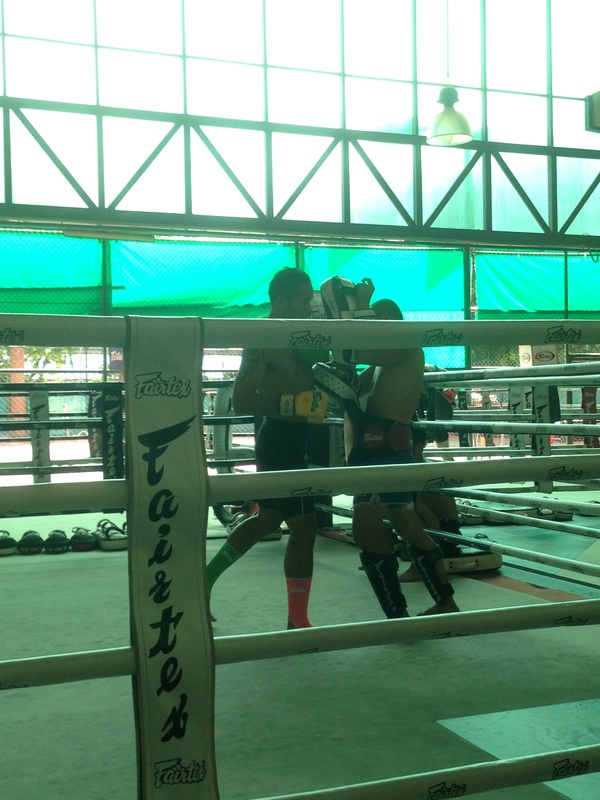 Incidentally, I believe it is frowned upon to show frustration during training as Thais prefer to go sabai sabai. 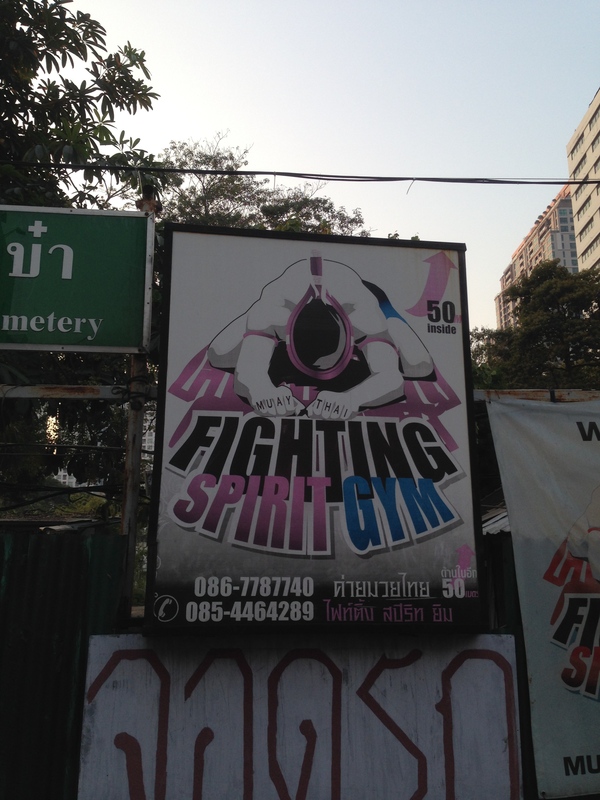 I am looking forward to paying Fighting Spirit Gym another visit sometime soon.